It’s early September and hot in Washington. I’m standing in the line filing its way into the State Department, digging through my wallet for my license and trying to sweat as little as possible in my black suit. My boss, Holly Burkhalter (IJM’s Vice President of Government Relations) and I are here to meet with Samantha Power, the U.S. Ambassador to the United Nations, to deliver a giant stack of signatures from people around the country who want the United Nations to make sure the issue of violence is integrated into the Sustainable Development Goals (SDGs). The SDGs are essentially the global community’s development agenda for the next 15 years. It’s our plan for eradicating poverty, advancing education, and protecting the planet. It’s the sequel to the Millennium Development Goals (MDGs) of 2000, which have catalyzed resources and policies to address these pressing issues. But the MDGs didn’t address violence and didn’t push explicitly for justice. Now, thanks to the support of tens of thousands of individuals and many organizations, the SDGs do. Globally, more than 30,000 people signed IJM’s petition, which we delivered to government representatives like Ambassador Power, who reassured us what a high priority combatting violence is. As I’m waiting to get into the State Department, I’m thinking back to February. I was rumbling through narrow dusty roads in an SUV with one of IJM Uganda’s social workers. We were visiting a few of our clients out in rural Mukono County, where IJM works to combat property grabbing. It’s a common crime, property grabbing, experienced by nearly a third of the widows in Mukono, and the stories start to sound similar. A man dies and, though his widow is legally entitled to inherit their property, someone more powerful than she comes and kicks her off, leaving her without a home and without land, often the source of her livelihood. We visit two clients, both of whom have been restored to their rightful property thanks to my colleagues in Uganda and the local authorities who have responded to their cases. We sit on grass mats under a shade tree as the first woman we visit tells us how she’s now able to get medication from a local clinic to address some health issues. The second woman we visit takes us into her backyard to show us the pigs that she now cares for, breeds and sells to support herself and her family. These two issues—health care and microenterprise—are well known needs in the global development sector. But for these women, neither would have been possible without first addressing the violence they faced. In a sense, these two moments could not be more different, sitting in an office in Washington and sitting on a grass mat outside a small home in Uganda. But really, they’re not as disconnected as they might feel. The Sustainable Development Goals have an impact on real people. That’s why it’s so important that the SDGs include the need for strong justice institutions to protect people from violence. We have a ways to go as a global community. We need to develop a strong set of indicators so we can measure the progress we make over the next 15 years. We need to invest resources into addressing some of the most pressing issues, like modern-day slavery (which is why the End Modern Slavery Initiative Act is so important). And we need to further our knowledge of issues new to the agenda—like justice. Only then can we better understand how to transform public justice systems and create real change that ensures that all people have access to justice, which is what we at International Justice Mission are doing in nearly 20 communities worldwide. It will be a long effort to realize the goals laid out in the SDGs, but I’m excited. The next 15 years are going to be good. 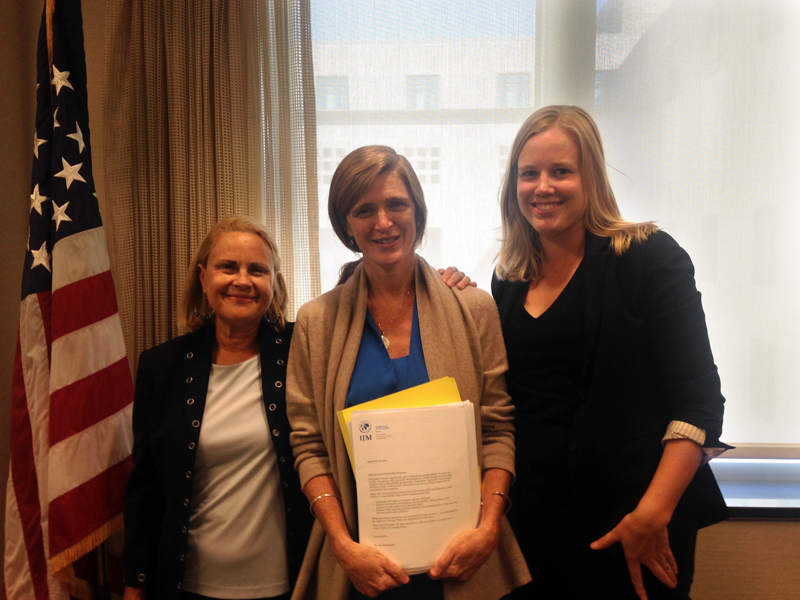 IJM's Vice President of Government Relations and Advocacy, Holly Burkhalter, and Senior Program Manager, Erica Boonstra, deliver signed petitions to United States Ambassador to the United Nations, Samantha Power (center). Find out more about the Sustainable Development Goals by visiting the Sustainable Development Goals Knowledge Platform site: click here. You can also visit IJM's SDG campaign page by clicking here. Curious about IJM's work and want to find out more? Visit our homepage, IJM.org. At IJM, we're celebrating because justice and protection from violence are part of the new global sustainable development agenda.